Google has just updated its Earth mobile application for iOS, reaching version 7.0, and in this latest build interesting features have been added, ones that will surely make Apple mad. Once the mobile app is upgraded, users will have access to 3D schematics of various buildings and a nice tour guide around the city. 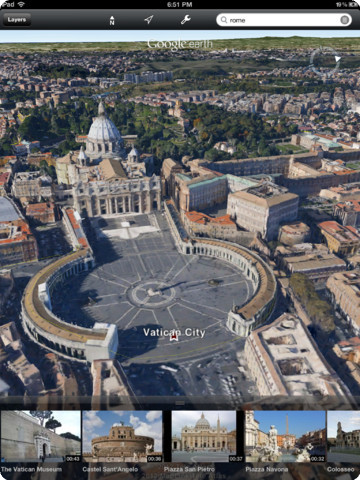 The first addition will enhance Google Earth with 3D effects for most buildings of well-known cities, such as Los Angeles, Boston, San Francisco, Geneva and Rome. These cities are being rendered with a fine detailed touch but Google has promised in the near future that more locations will be added on the list, presumably in the upcoming weeks. The second feature in question is a small preview guide of famous sites within a city. If the user approaches a particular city, the application will pop a menu with a list of the most interesting things that can be found in that location. If one of these tiles is tapped, the app zooms in a rotating view and presents some cities about the museum, bridge, etc. Google Earth 7.0 is free of charge and supports iOS 4.3 as minimum, but unfortunately it has been limited to the iPhone 4S and the iPad 2, because of higher-hardware requirements.